For decades, hordes of demons have ruled the Worldwound. Their Abyssal corruption has poisoned the land. Previous crusades did their best to contain the demonic invasion with the invaluable aid of a line of fortifications enhanced with magical wardstones. Yet of late, many of the crusaders have become complacent or simply fatigued from an endless war, while all along, the foul masterminds of the demonic invasion have built a deadly plan. They want to expand the Worldwound's Abyssal corruption past the wardstones and spread their evil across the entire world! Whether you're a stalwart crusader or a simple mercenary, the Storm King's profane machinations will soon surround you. The time has come to live up to your true mythic potential and become a legendary hero in the world of Golarion! In an adventure unlike any other, the Pathfinder Adventure Card Game Wrath of the Righteous Base Set will take you into the depths of the Abyss - and back again! This complete cooperative strategy game pits 1 to 4 heroes against eh monsters, temptations, corruption, and treachery of the Pathfinder Roleplaying Game's popular Wrath of the Righteous Adventure Path. Choose your character's class, build a deck of equipment and allies, and explore dangerous locations as you play through multiple scenarios in an exhilarating mythic fantasy adventure. Characters grow in potency and potential, learning expert skills, gaining magical might, and adding powerful boons to their decks. 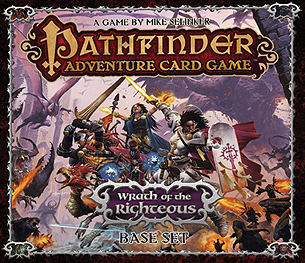 All of this will prepare them to surmount greater obstacles through a complete Pathfinder Adventure Card Game Adventure Path. More than 500 cards, featuring 7 character classes, a wide array of gear and magical accoutrements, 6 paths to mythic power, and dozens of allies, monsters, and villains from the Wrath of the Righteous Adventure Path. The Worldwound Incursion Adventure Deck, which begins your journey through the Wrath of the Righteous Adventure Path. A complete set of 6 polyhedral dice. Supplement your Wrath of the Righteous experience with the Character Add-On Deck, Class Decks, monthly Adventure Decks, and Ultra-Pro accessories.